…that’s what parents find when they visit Villa Maria School, nestled among seven wooded acres in northern Stamford, CT. Teaching and learning at VMS is like nothing you’ve seen before. Classrooms are cozy, intimate spaces, with only 3 or 4 students at a time working with a caring and experienced special education teacher. With a diagnostically driven core program of reading, language arts, math, social studies, and science, combined with a robust program of visual & performing arts, athletics & physical education, and ethics & social / emotional classes, VMS provides a depth and breadth of education to inspire every students. By partnering with our team of occupational, speech / language, and social/emotional therapists, our faculty employ innovative instruction to empower our students with learning strategies and academic study skills for a range of language-based learning differences. Religious classes are optional at Villa Maria, however classes offered in such topics as General Ethics, the Old and New Testaments, and Catholicism, in addition to students studying for their Bar/Bat Mitzvah, demonstrate the diversity of students in our community, each seeking to become the best and brightest versions of themselves both in and out of the classroom. Our graduates demonstrate an outstanding record of success in public, independent day, and boarding schools. 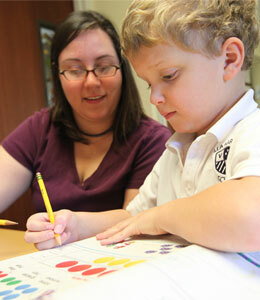 Villa Maria School currently enrolls students in grades K-9. I’d invite you to visit campus for a personal tour and to get to know each other better. Please feel free to email me at sbennhoff@villamariaedu.org, or call me at 203-332-5886, ext. 104. I look forward to hearing from you and moving ahead from there.